This wrong signal I am talking about is related to the evacuation of stools. I am talking about this as it is one of the things that I have suffered from personally. Even today I sometimes have to battle with not being sure whether it's the right signal or the wrong signal. However today, with my method that I use on the toilet, I soon find out which signal it is and act accordingly. This problem occurs mainly to the people who have been told to go to the toilet at the same time everyday. This statement I hear and see it being repeated all the time by very reputable sources. 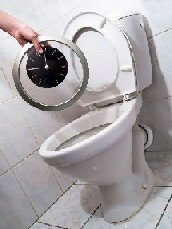 In so doing this for a period of time, the bowel movement will come everyday at the same time. This is the biggest mistake you can do. After a while of using this system, it's your brain that takes over the control of evacuation. You start looking at the watch to see if it's time or not. You will definitely go at the given watch time, give or take thirty minutes. SIDEBAR: I think only the people that have experienced this situation can understand what I am talking about, in other words not knowing if it's the right or wrong time to go. Some of you will realize you are in this situation by reading this article. A lot of the time the stools are not really ready, but you still go to the toilet thinking you have the right signal. This will often result in PUSHING and STRAINING out the stools and you will have a big chance of causing a disaster to the hemorrhoids. Go to the toilet at any time it happens. Day or Night. It could be today at 10am and tomorrow it could be at 6pm. Just feel the right signal. This is the perfectly normal behavior to evacuate, and in thus doing avoiding any complications with hemorrhoids.